As posted on the AAO website, elderly patients seen in the office have special age-related health problems and emotional needs, which should be considered. Elderly patients are often anxious and fearful of losing their independence and financial security. They may be facing limitations of mobility that may cause them not to relate well or be difficult to examine. An elderly person may also be particularly worried about declining health and may notice or complain about subtle changes in vision. Examiners should not overlook or downplay these observations. Make note of the symptoms so that the doctor can follow up. Apprehension about their condition may be greater than with younger patients. Some elderly patient fear impending blindness, even with relatively minor eye problems. Loss of eyesight is another obstacle to independence. Visual acuity is only one aspect of functional vision that may be affected by eye diseases. Color perception and contract sensitivity are often affected as well. 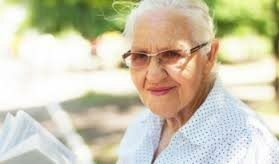 Many elderly people live alone, so a small change in objective acuity may cause a big change in functional ability; for example, changing from 20/30 to 20/40 may seem trivial, but it may make the difference between being able to read the newspaper or the label on a medication container easily and with confident. Having to give up shopping alone, driving or other independent activities because of declining abilities and eyesight can be a very difficult adjustment and one that requires sensitivity and compassion on the part of health care providers. The special needs of elderly patients can be multifaceted. Some elderly patients may have one or more chronic illness or limitations on their ability to maneuver easily through their daily activities. The current visual loss may be just the latest event to occur among other medical concerns. Some elderly patients also have loss of hearing, which can compound their sense of isolation. Speak slowly and distinctly to patients who have difficulty in hearing, but do not assume that an elderly patient will have difficulty hearing based on his or her age alone. If you determine that the patient is having trouble hearing you, face your patient squarely and allow the patient to see your lips so he or she can obtain extra clues to what you are saying. It is rarely necessary to raise your voice excessively and never necessary to shout. Many elderly people who are “partially sighted” do not get around as well as a younger and possibly more severely visually impaired individual who may be in better general health, have a broader support system and be more optimistic. However, no one can predict a patient’s reaction based on age. A sudden loss of vision for one patient may be far more devastating than a slowly progressive one for another. Some older persons mistakenly believe they should “preserve” their eyes by not “using them up.” Tell them it is not possible to use up their eyesight, even if a visual abnormality exists. Encourage them not to sit in the dark, not to give up hobbies and to continue reading or doing other near work. By participating in living as fully as possible, they will have a better quality of life.